This blueberry coconut chia pudding is an easy, healthy dessert you can feel good about eating. Last year at this time I was 10 days into a paleo challenge with my Crossfit box. This year, they’re all about to embark on another one and I’m eating more carbs than I have all year. Ironically enough, I’m also stronger than I ever have been and making my way through my fitness/Crossfit goals one by one. So yeah, the paleo challenge can kiss it this year because I have absolutely zero motivation to entertain that again. For example, this dessert in my mind is completely healthy and good for you. It’s packed with coconut milk, chia seeds and antioxidant filled wild blueberries. The paleo gods however, would take all my points away for the day because there’s 1 tablespoon of honey in it. Ain’t got time to live like that. I talked a bit about resolutions on Monday or more so, how I don’t do them. And while that’s true, I have been a bit more mindful of what I’m eating so far this month. That doesn’t mean restriction in anyway, it just means more balanced choices with dessert. Yes, dessert. There’s no way I can go cold turkey on dessert and there’s really no reason anyone should in my opinion! Winter nights are for cups of tea (specifically Trader Joe’s candy cane green tea), a piece (or 2) of dark chocolate or…chia pudding. If you’re not someone who gets freaked out by the texture of tapioca, then I promise you can do chia pudding. If you are…well then, sorry. This probably isn’t your thing. I love the coconut/blueberry flavor combination but really, anything is possible here. Keep the liquid to chia ratio similar and just add whatever fruits and flavorings you like! 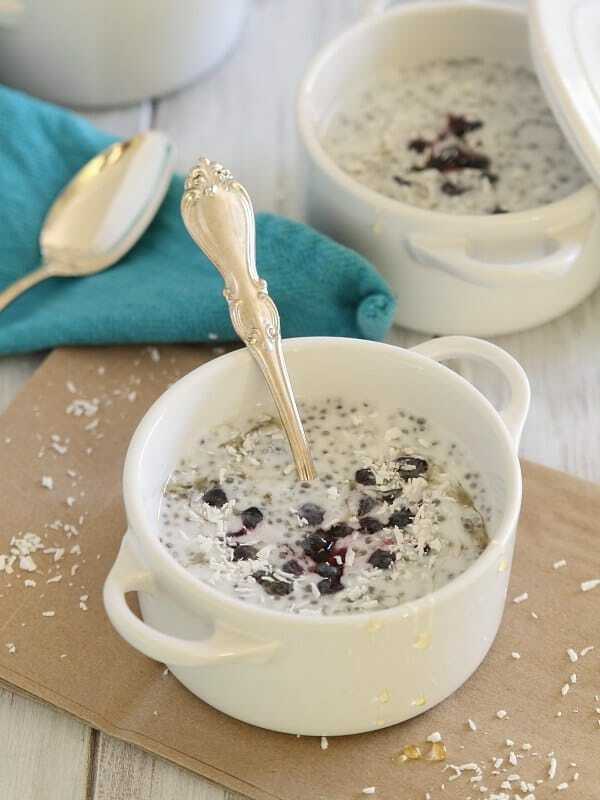 Love this blueberry coconut chia pudding recipe? Try these other pudding recipes: Dirty Chai Tapioca Pudding with Oatmeal Raisin Cookie Crumble, Pumpkin Chocolate Chia Pudding and Coconut Caramel Coffee Pudding. *This post is sponsored by Skinny Cow. All opinions and content are my own. Thanks for supporting the sponsored opportunities I choose to feature on here! I have been thinking I should be trying this chia seed pudding thing! The combo of blueberries, coconut and honey sounds deeeelish. These pictures are gorgeous Gina! I love your little white ramekins…where did you get them? 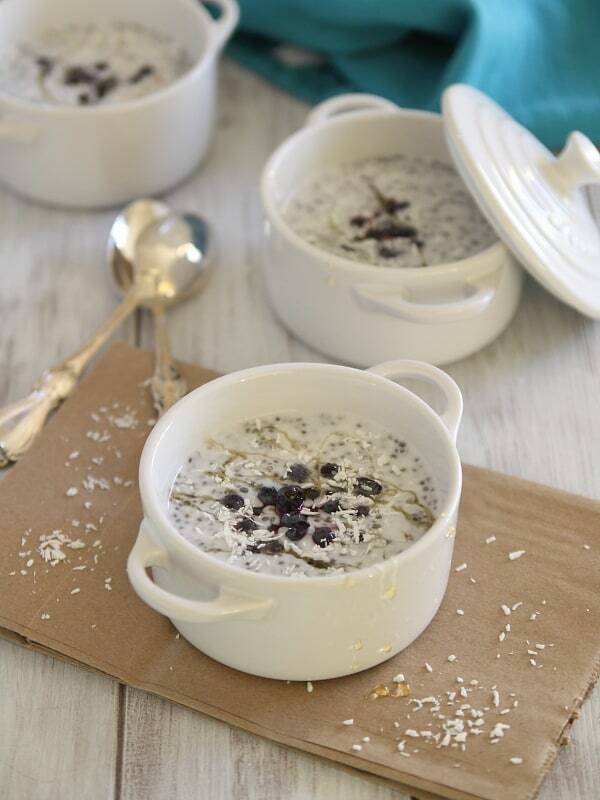 mmm I’ll have to give this chia pudding combo a try! looks delish. and trader joe’s candy cane green tea? the best. i keep stocking up on boxes to get me through the year. That’s crazy that the one TBSP of honey would take your points away!! No thank you paleo! This pudding looks amaze! I think I shall indulge now! I have all the ingredients on hand for these – making today!! I love the coconut milk used in this! Chia seeds and coconut milk are the perfect fit! G’day Looks terrific and healthy Gina, true! Happy New Year! Love the combination and have pinned it too! I love this flavour combination! I’ve never thought of pairing coconut with blueberry but it sounds incredible. It has a berries and cream thing going on. Mmmm. This looks so tasty! Love the blueberry and coconut combo. Can’t wait to try it. In fact, I might make it for breakfast tomorrow… I know it’s not breakfast food but it just looks so good! Yum! I love chia pudding! I tried Chai pudding when my friend made it one time, and at first I was worried about the texture, but it turned out to be really good. I did throw some chopped nuts in it for a little crunch. Also, I tried doing the Whole 30 challenge recently to try and curb my addiction to desserts. I lasted one meal, breakfast. I don’t want something that restricts me. I do think it’s all about balance. Those little LeCreusets look familiar! I love this pudding and I’m firmly behind you, carb it up (reasonably) and own it. I made this with unsweetened vanilla coconut milk and I really thought it was fantastic. I did not have blueberries on hand but did have frozen blackberries and they were wonderful. I’m so glad I tried this recipe, it will be added to my list of dessert recipes to use in a pinch. Thanks so much! I wouldn’t say “kiss paleo goodbye” since Paleo in itself is not low-carb. To point a finger at some added honey or saying that paleo must be low-carb sounds simply absurd. The authorities, like Robb Wolf, are very clear on Paleo being carb-agnostic (if you are an active athlete with no weight-issues or other metabolic problems that would benefit from a more low-carbish approach). Anyway, never tried this recipe and will give it a shot. Have a nice day! Please specify on what type of coconut milk. The one you buy in the milk section in a carton…or…the one in a can. You can use either. If you use the can, just stir it so the cream and water parts are mixed well. For this recipe I used the coconut milk in a carton though.